Risk of corruption in JOBS Act shareholder rule: McCutcheon v. FEC underestimates power of small donations. The Supreme Court is wrong about the influence you can buy with less than $5,200. What could this kind of money get you on the Hill? Plenty. Photo illustration by Slate. Photos by Larry Downing/Reuters and Hemera/Thinkstock. What does $1,000 get you these days? A Prada T-strap? Yes. A little wine with dinner if you are former Virginia Gov. Bob McDonnell? Yes. Oh, and federal legislation favorable to your company? Maybe so. In McCutcheon v. FEC, Chief Justice John Roberts made an assumption about the relationship between money and politics. He contended that a $5,200 contribution by a donor to a candidate is simply not enough money to create a “cognizable risk” of corruption. As the dissent vigorously protested, Roberts arguably changed the rules of the campaign finance game—without, of course, admitting as much. To protect the free-speech interest of donors, the court has always limited the permissible reach of campaign finance law to preventing corruption and the appearance of corruption. But the decision in McCutcheon narrowed the field enormously by saying outright that the only kind of corruption the law may now target is a very specific kind of corruption: quid pro quo corruption, an actual exchange of political favors for money. Before the McCutcheon decision was issued this April, each individual donor could contribute up to $5,200 to a single candidate (the “base limit”) but no more than $48,600 overall in a single election cycle. This rule limited the total number of candidates to whom you could donate the maximum amount to nine. Roberts reasoned that amounts less than $5,200 would invariably be too small a quid to sway electoral candidates to offer up some political quo. The majority in McCutcheon thus struck down the aggregate limits as unconstitutional because they were redundant: Assuming that the $5,200 base limit was enough to prevent the risk of quid pro quo corruption, why would we even need the aggregate limit? Stripped to its essence, the court asserted there was no risk that a member of Congress would take an action in exchange for such a tiny sum. Yet my research into an obscure area of securities law has uncovered a case in which a mere $1,000 donation appears to have triggered a legislator to introduce a bill favorable to that donor. That series of events may be—at least, it should be—enough to qualify as “corrupt” for the purposes of campaign finance laws. If so, this story shows why the Supreme Court’s jurisprudence—even taken on Roberts’ own terms—is fatally flawed. Reader, be patient. The story is a complicated one, and it took a mixture of luck and persistence to reveal it. I need to establish some securities law background first: Prior to the 2012 Jumpstart Our Business Startups, or JOBS, Act, Section 12(g) of the Securities and Exchange Act of 1934 required firms with more than 499 shareholders to make public disclosures to the SEC (the “500-shareholder rule”). Effectively, Section 12(g) said to corporations with 500-plus shareholders: Even if you want to stay private, you still need to make annual and quarterly filings as if you were a public company. Unsurprisingly, most companies with so many shareholders—think Google, think Facebook—go ahead and go public via an initial public offering so that they can gain access to the capital markets and trade on a national exchange. The thing is, no one ever looked at how many shareholders companies typically have at the time they go public—even though that information is publicly available. Given my deep and abiding interest in securities law topics that are stultifyingly boring to most people, I gathered the data. My research has revealed that most companies go public with far fewer than 500 shareholders. Indeed, between 2000 and 2012, less than 4 percent of them went public with more than 400 shareholders. Google and Facebook were anomalies; Section 12(g) forces hardly any companies to go public. But in 2012 Congress changed the rule anyway, amending Section 12(g) to raise the limit to 2,000 shareholders (as long as they’re accredited investors, i.e., wealthy) and to exclude from the count employee shareholders and crowdfunding investors. As I proudly presented my research on this subject, people kept asking me: Why? Why did Congress raise the 500-shareholder threshold in 2012 if there wasn’t a problem? The answer: follow the money. Section 12(g) wasn’t a problem for most firms, but it was a big problem for one. SecondMarket is a trading platform that provided a market for the secondary trading of the shares of privately held corporations. The firm’s business model was premised on keeping companies private and letting accredited investors buy shares on its exchange. SecondMarket’s problem lay in Section 12(g): The more of its clients’ shares that were bought and sold on its exchange, the more shareholders each client accumulated. In short, the very existence of Section 12(g)’s 500 shareholder rule threatened SecondMarket’s whole business model. Meanwhile, back on the Hill: On May 24, 2011, Rep. Jim Himes, D-Connecticut, a member of the Subcommittee on Capital Markets and Government-Sponsored Enterprises, introduced H.R. 1965, which requested a study of the appropriateness of Section 12(g)’s thresholds. Within two weeks, two SecondMarket employees—its CEO and head of public affairs—each donated $1,000 to Himes. The Federal Election Commission database does not include any record of either of these individuals having made any political campaign contributions—to Himes or to anyone else, ever—prior to Himes’ introduction of H.R. 1965. On June 13, 2011, SecondMarket’s CEO also donated $1,000 to Rep. David Schweikert, R-Arizona, another member of the Subcommittee on Capital Markets and Government-Sponsored Enterprises at the time. And the very next day, Schweikert introduced H.R. 2167, the Private Company Flexibility and Growth Act, which proposed raising the threshold to 1,000 shareholders. Even more favorably to Second Market, the bill excluded from even that heightened threshold any accredited investors—by definition, all of SecondMarket’s buyers. SecondMarket’s CEO had no obvious connection with Arizona and, save for his earlier donation to Himes, had not, according to the government’s database, made prior campaign contributions to anyone ever before. According to my data, in total SecondMarket employees contributed $34,500 to senators and representatives, largely those on key committees, as various bills traveled through Congress in 2011 and 2012. At the same time, SecondMarket spent $380,000 on lobbyists, and its CEO testified on the Hill. All those efforts worked, culminating in the 2012 JOBS Act, which gave SecondMarket precisely the relief it sought. 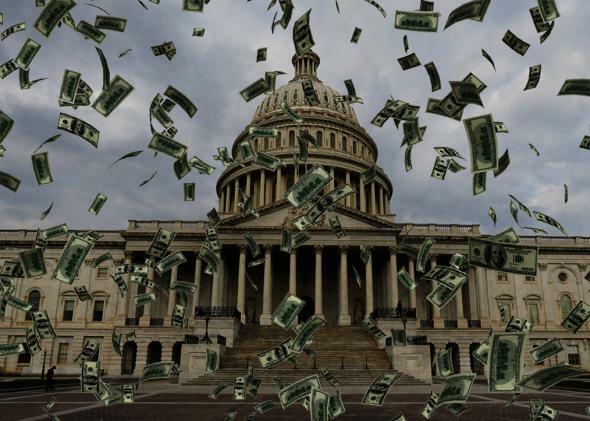 So what does this story from the trenches of congressional campaign contributions tell us about the state of campaign finance law? I do not suggest that bribery or even actual corruption occurred in the case of SecondMarket’s employee donations during the 2011­–12 election cycle. I don’t need to do so to make the point that Roberts was wrong in his assumption that there is no “cognizable risk of corruption” below the base limits. The SecondMarket employee donations are all well below the magic $5,200 threshold, and thus perfectly legal. And yet the timing of the ones described above in particular demonstrate that the risk of corruption or its appearance can manifest even with relatively low dollar sums. The larger significance of the SecondMarket/Section 12(g) story depends on how widespread you think this kind of practice is. And it’s hard to know the answer to that question. To the extent that quid pro quo corruption exists, the odds are it won’t be evident on big ideological questions—abortion or gun control—where $5,000 or even $50,000 wouldn’t be enough to sway a member of Congress. But obscure tax or securities law issues where no one is looking? My intuition is that the risk of corruption, or the appearance of corruption, is a lot higher here, and even a sum under the base limit of $5,200 could get an eager donor some kind of quo. Which means that maybe those aggregate limits that McCutcheon struck down were actually doing some good after all—limiting the number of instances of base limit donations makes sense if there actually is a “cognizable risk of corruption” under $5,200. The Supreme Court thinks it knows the price of corruption. But it may be wrong.